Caffe Cino stars, like all Off-Off actors, played in many venues. For starters, see H.M. KOUTOUKAS and HARVEY TAVEL in RON TAVEL’S “In Search of the Cobra Jewels” on DONALD L. BROOKS’ blog HERE. IRVING METZMAN (The Brown Crown) donated three far-flung images of himself. IRVING hooded at far left and EDDIE BARTON (A Letter from Colette) barechested at far right in an unidentified play at Theater for the New City. Center couple are George Bartinieff and JOYCE AARON. Left, IRVING as the corrupt TV spokesperson Arnold Bliss in my Dynel at Norman Hartman’s Old Reliable Theatre Tavern. Right, JEANNE LANSON (The Spring Horror Show) and IRVING made their stage debuts in ROBERTA SKLAR’s production of my The Sleeping Bag with beautiful Stephanie Gordon at Tony Bastiano’s original, upstairs Playwrights Workshop. Photo: JAMES D. GOSSAGE. Exuberant NEIL FLANAGAN and unidentified lovelies in “Heavy Confetti,” a hig benefit for and at the WPA Theatre, 1971 or 1972. Atop the Empire State Building (really), NORMAN THOMAS MARSHALL as RONALD TAVEL’s Gorilla Queen, with other cast members of the show which started at Judson Church. This is probably publicity for the Off-Broadway move. NORMAN THOMAS MARSHALL and Harvey Fierstein in AMERIKA/ CLEOPATRA by Jackie Curtis directed by HARVEY TAVEL at the WPA (1971). At the Playbox Studio, BILL HAISLIP and JACQUE LYNN COLTON in JOSEF BUSH’s terrifying Evening Raga. WILLIAM M. HOFFMAN, Joe Pichette, and NEIL FLANAGAN in Hoffman’s X’s, The Old Reliable. DAN LEACH (right) and others torment a transvestite in GEORGE BIRMISA’s Georgie Porgie, Village Arena. My The Haunted Host with Joseph Pichette and NEIL FLANAGAN was the first and last play to be done at the Castle Theatre, 1969. The people who rented us The Castle (a deteriorating church) also after our opening weekend rented the basment just below us to a tap-dancing show which drowned out any chance of “The Haunetd Host” being heard. When we tried to sue them, we discovered that they did not in fact own the building, but had stolen the keys while the owner was out of town. NEIL FLANAGAN, BOB SHIELDS, MARY WORONOV, and HELEN HANFT rehearsed but did not get to open my The Sleeping Bag at Bastiano’s basement venue for his second Playwrights Workshop, 1967. BILL HAISLIP and Barbara Bauer appeared in my The Golden Circle, the first and last play to be done at The Spring Street Players, 1972. DORIC WILSON’s star JANE LOWRY (standing) in an N.F. Simpson play at the Jan Hus Theatre, 1961. CHUCK GOLDEN and a beardless JOE DAVIES first and second from left top row, and a clean-cut HAAL BORSKE fifth in Laugh With Leacock at the 13th Street and East End theatres, 1962. They also played the Cino and La Mama. MICHAEL WARREN POWELL in CLARIS NELSON’s “The Road Where the Wolves Run,” Circle Repertory Theatre. Many Cino People “hit The Old Reliable Theatre Tavern.” NEIL FLANAGAN and VICTOR LIPARI were John the Baptist and Bobby Dylan in my Joyce Dynel. BILL HAISLIP and Jeffrey Herman found each other in my Fog. JOHN BORSKE and WILLIAM M. HOFFMAN played in Neil’s comic-book production, Puddnhead Wilson. 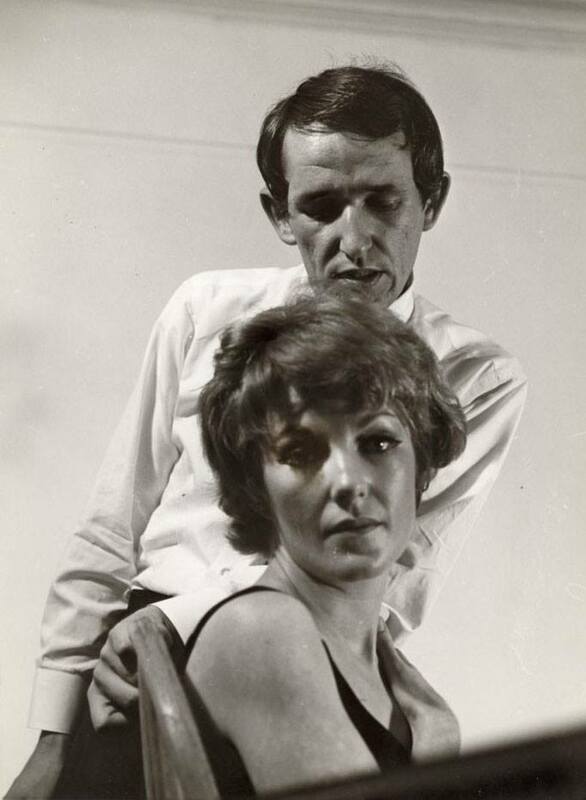 Left: MATT BAYLOR and Rosemary King in The Naked Heart. Right: Robert Quarry is wooed by KEITH CARSEY in Splinters. Both plays at The Cooperative Theatre Club, 1967. Center: KEITH CARSEY watches GLENN DU BOSE dance in South Pacific at Kennebunkport Playhouse, Maine, 1961. JOHN GUARE’s “Two Gentlemen of Verona,” 1973, Joe Papp’s Public Theatre. Joe Chaikin paints JOYCE AARON in SAM SHEPARD’s Fourteen Hundred Thousand at Theatre Genesis. Barry Kael strangles GEORGE BIRIMISA in George’s play, “Georgie Porgie,” 1968, Cooper Square Theatre. Photo by Avery Willard. STOCK!!! APOLLO DUKAKIS and NEIL FLANAGAN in Light up the Sky at the Sharon Playhouse, Connecticut, 1970; MAGGIE DUKAKIS and BILL HAISLIP in Goodbye, Charlie, the Lubbock Dinner Theater, Texas, circa 1967. How Off-Off can you get? KOUTOUKAS play, 1972. From the blog of Lisa Jane Pwersky. Robert Heide’s “Crisis of Identity” presented at the Theater for the New City. Daryl Marsh is pinning Robert Frink to the floor as Regina David looks on. Dennis Helfund and Marilyn Joan Roberts in THE CLASS by Gregory Rozakis, directed by RON LINK at Tony Bastiano’s Loft. It seems fitting to close this page with a tribute to the actor who worked everywhere. CHARLES STANLEY was a tragedian, a comedian, a dancer, and a travesty actor–sometimes all at once–so he seemed to fit in everywhere. Above you see him at left at Theatre Genesis in his own King of the Sun, at far right at Judson Church in Black and White and Sparkle Plenty with his frequent collaborator, DEBORAH LEE, and center, that’s CHARLES’ mop of hair poking out of a gigantic cloak at Westbeth in JEAN-CLAUDE VAN ITALLIE’s A Fable. CHARLES certainly did fit in everywhere. AL CARMINES asked my help informing people of CHARLES’ death. I called 30 or 40 men and women CHARLES had worked with, most of whom gasped, “He was my lover, you know.” King of the Sun photo by JAMES D. GOSSAGE. The photo listing a Sharon Dukakis is incorrect. The name is Maggie Dukakis. She is my wife. Actually the name she was going by at the time of that production with Bill Haislip was Maggie Evans. So the confusion was inevitable and understandable. That’s so great that Neil Flanagan performed in your play! I love seeing all the photos of him in this collection; I always found him very attractive and an excellent actor!